Hi! My name is Meg and I’ve been a part of the team from day one. I’m currently owned by a cat named Mac, a ball python named Ragnar, and two Heeler/Boarder Collie Mixes, Rainier and Everest. I’ve lived in the PNW my entire life and have grown extremely passionate about the environment. 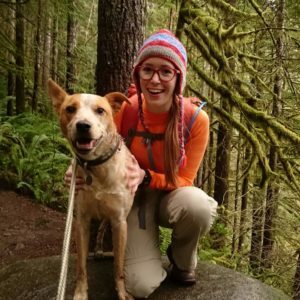 When I’m not at the office helping the team schedule your appointments or playing with the day care and boarding pups; I enjoy long scenic hikes, small lakes to swim in, and exploring the Pacific Northwest’s hidden pet friendly hikes! I look forward to meeting you and your pets and providing them with the best care possible!